The battlefield of the past is an opportunity for the future commander, the future manager to reflect. The books rationale for translating military concepts into management speak is the authors impression in the classroom that managers in commercial organisations tend to follow ‘outdated’ models of management, without reflecting on a military science that is believed to provide thought leadership. 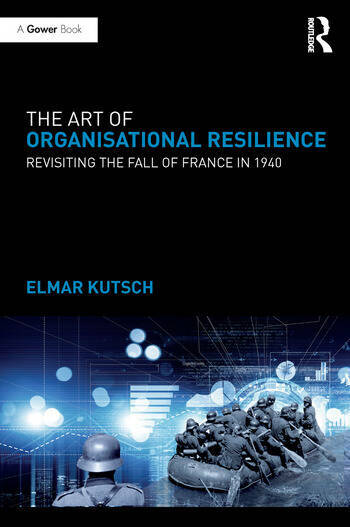 The case study of the Fall of France in 1940 is a contest between two archetypes of organisational resilience, with one prevailing over the other. The resulting insights shaped military science; concepts such as Auftragstaktik have found its way into doctrinal thinking of modern armies as well as framed contemporary management literature. This book provides a compelling analysis of the monumental events in May 1940, and provides rudimentary answers from a military and management perspective, true to the premise of history. The Art of Organisational Resilience is a highly distinctive and readable book that explores the strategy, operations and tactics of modern business and the role of resilience in sustaining business in increasingly complex, often fast-changing and adverse conditions. Elmar Kutsch is a Senior Lecturer in Risk Management, Cranfield School of Management. His passion for the management of risk and uncertainty in projects led him to pursue a career in academia. He served as a Lecturer in Operations Management at the University of Surrey and has been at Cranfield since 2007.